The Daily Telegraph has published an interesting article about using cheap 'tracker' funds to create an income-oriented portfolio. Over time, I have sought to automate and diversify the DIY Income Investor portfolio by using Exchange Traded Funds, which are a cheap and easy way to 'buy' a (fairly) sustainable income, as well as accessing world markets. 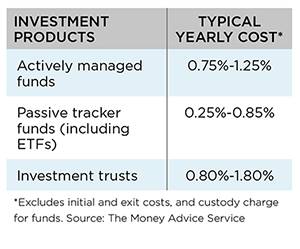 'Active' funds - which fund managers fiddle with and refresh - usually come with a hefty management fee, plus more hidden costs associated with the 'churning' of the holdings. By contrast, 'tracker' funds are based on a specific index and are relatively easy to manage, resulting in a lower cost. I personally prefer Exchange Traded Funds over 'tracker' funds, as ETFs are easy to buy and sell - and have no entry or exit charges. The portfolio yields 3.6% overall. By comparison, the DIY Income Investor portfolio is split approximately 50/50 between dividend shares and fixed-income (including bonds), both of which are diversified globally. Nearly half (45%) is held in ETFs and other funds. The DIY portfolio yields 5.7% but is more risky - as highlighted by the Carillion holding, LSE:CLLN, which has just cancelled its dividend! So, do you think carillon is now a buy - based on the fact the bad news is built in and share price falls are usually over-blown? Haha! That's true, but as there's no income I wouldn't look at it now. Despite the bad news, I'm sitting tight for now - as you say, the price is likely to recover in a few months. Carillion collapsed again today. I count myself lucky to have got out at 1.34. After holding for 5 years and collecting dividends I am only 12% down. Happy to move on and find another investment.